If you have lost any keys, jewelry etc. - we do have some of these items at the Village Office Lobby or in the Village Office. Please describe and it will be returned to you. 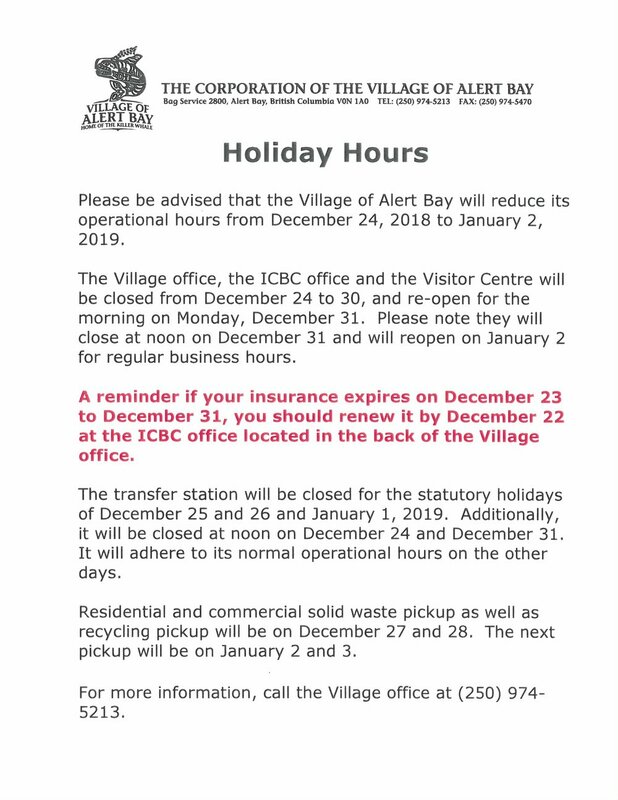 Possible interruption with ICBC Services click on link below to see Poster for details. If you are unable to make these dates there will be other posted opportunities soon. 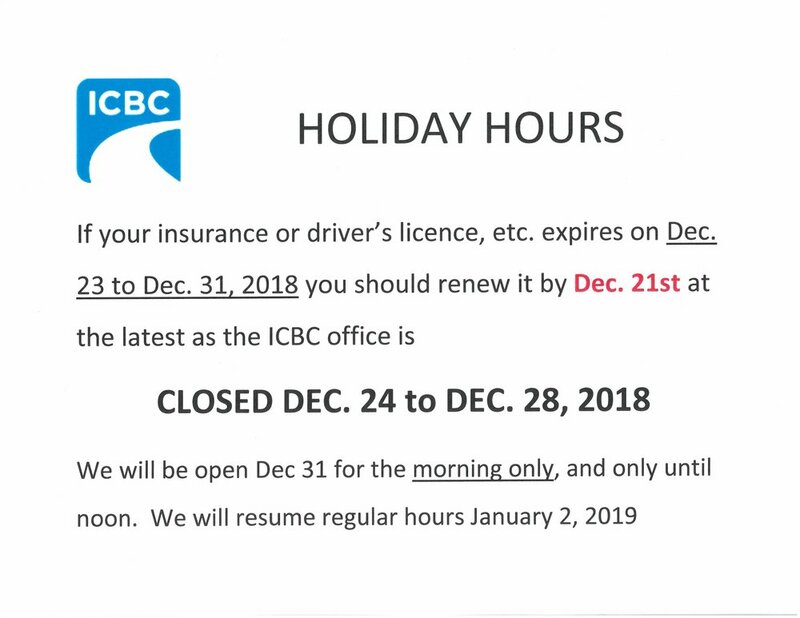 ICBC, BCID, BC Service Card Office has MOVED around back!!!! ICBC, BCID, BC Service Card Office has MOVED to another part of the Office see poster for details. Please note the hours have remained the same. North Island Veterinary Hospital Alert Bay out Clinic. Monday, September 17, 2018.
during the Nomination Period, from 9:00 am Tuesday, September 4, 2018 to 4:00 pm Friday, September 14, 2018. Nomination packages, including required forms, are available for pick-up at the Village Office during regular office hours, from 9:00 a.m. to 4:30 p.m., Monday to Friday, (excluding statutory holidays) to the close of the nomination period. Come and enjoy Canada Day starting at 11:00 AM Sunday July 1, 2018 at the Gilbert Popovich Memorial Town Square. There will be Canada Day Cake, Hot Dogs, Summer Market. As an essential member of the Village staff, the Receptionist/Administrative Office Clerk reports to the Chief Administrative Officer and Deputy Chief Administrative Officer. Responsibilities of the Village’s primary front counter representative include, but are not limited to: responding to enquiries from the public, processing accounts payable and receivable, boat harbour billing, performing bank reconciliations and assisting customers with tax and utility accounts, providing property information, etc. This is a full-time position Monday through Friday (8:30AM – 4:30PM) and includes a competitive benefit package. Work experience in the Municipal sector, is desirable; experience working within other comparable organizational frameworks will be considered. This position is available immediately – please include your availability with your application letter. For more information on our community please refer to our website at www.alertbay.ca. The Village of Alert Bay thanks all applicants for their interest in applying for this position however, only those selected for an interview will be contacted. The Village of Alert Bay 2017 CARIP report is available for review here. The Village of Alert Bay Annual Report is now available for public inspection. The report can be viewed at the municipal office at 15 Maple Road, Alert Bay BC during regular business hours Monday to Friday 8:30AM to 4:30PM. The document is available online at alertbay.ca. The Village of Alert Bay Council anticipates adoption of the 2017 Annual Report at the Regular Council meeting on Monday, June 25th at 5:00PM in Council Chambers. The public is invited to attend with questions relating to the report. The Village of Alert Bay seeks a casual, on-call Administrative Office Clerk to provide support for the Village’s administrative team, including sick leave and vacation coverage. Office hours are 8:30AM – 4:30PM, Monday to Friday. The Village offers a competitive wage and benefits package. Reporting to the Chief Administrative Officer and the Deputy Chief Administrative Officer, the role is primarily responsible for providing front counter customer service which includes, but is not limited to, responding to inquiries from the public, processing accounts payable and receivables, boat harbour billing, performing bank reconciliations, receiving payments made to the municipality, assisting customers with tax and utility accounts and providing property information. Public sector or corporate administration, preferably in the Municipal sector is an asset. For more information on our community please see our website: www.alertbay.ca. The Village of Alert Bay thanks all applicants for their interest in applying for this position, however, only those selected for an interview will be contacted.